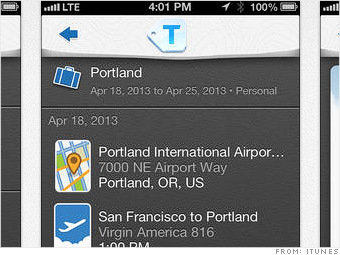 This free iPhone and iPad app organizes your trip itinerary into one "digital travel wallet." Be forewarned: It takes a bit of time to input membership info for hotel and travel sites. But once the data is connected, every time you book a flight, reserve a rental car or make a hotel reservation, it automatically uploads to your Traxo itinerary. Can't keep track of your frequent flier miles? Its got your back: Alerts come when they're about to expire.